Residents flee a flooded area in Kurashiki, Okayama prefecture, on Sunday. Heavy rains have devastated central and western Japan. 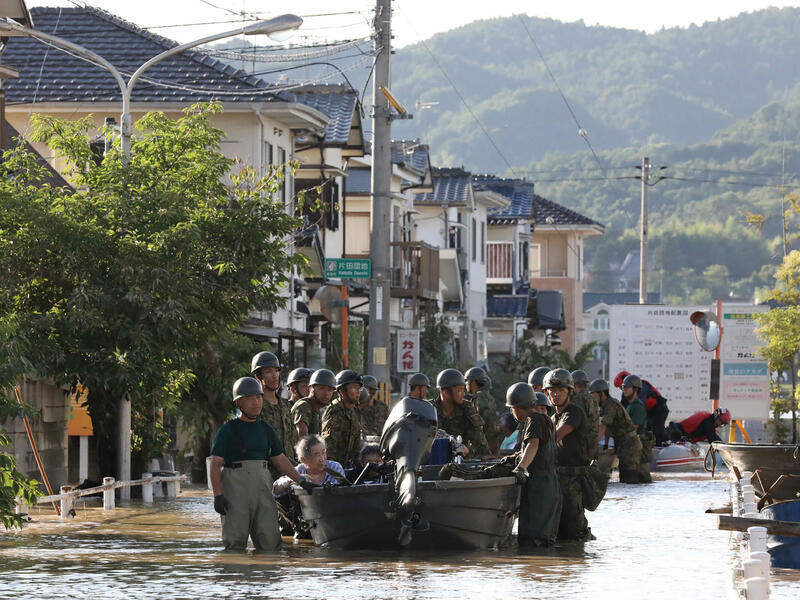 Japan's Self-Defense Forces use boats to rescue people from Mabi Memorial Hospital, which was isolated after flood damage. Dozens of people are presumed dead in flooding and landslides triggered by massive rainfall in Japan's southwest, and the numbers are expected to increase, Japanese officials said Monday. Government officials said more than 100 people are dead, while Japan's Kyodo news service put the figure at 116. The news agency said the death toll is expected to increase as officials reach affected areas to assess the situation. Tens of thousands of people were trapped by floodwaters in numerous prefectures. 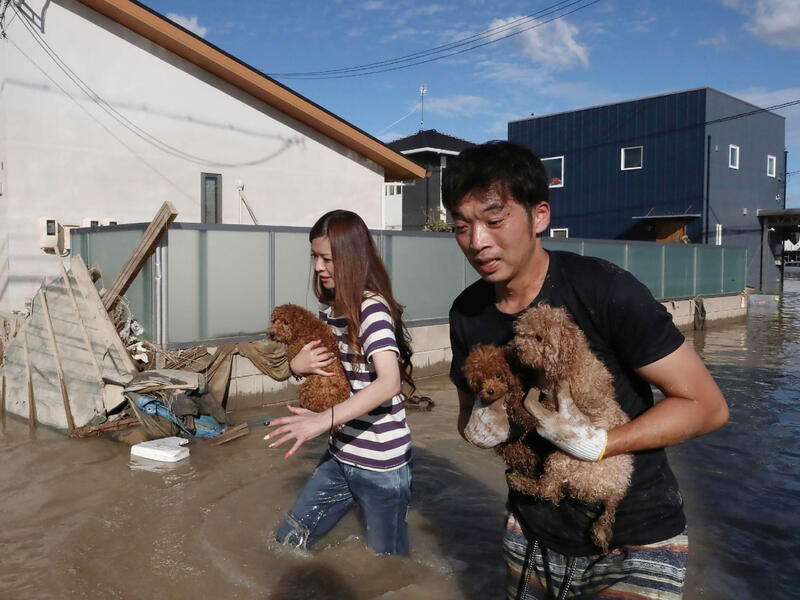 In Okayama, one of the hardest-hit prefectures, more than 1,000 people were temporarily trapped on rooftops after the Oda River broke three dikes that had held the floodwaters back. Search operations carried out by Japan's Self-Defense Forces were continuing. Floodwaters are gradually receding, according to reports from the area. The deluge began Thursday, as torrential rains pounded large parts of the country, including the cities of Hiroshima and Kyoto. Within a 72-hour period, 93 locations reported record rainfall, John Matthews reported for NPR in Tokyo. Rivers surged and the ground loosened, causing some people to be swept away by rushing water and others to be buried alive in landslides. Video footage showed people being airlifted to hospitals and others heading toward dry land on rafts. "I went to my father's family home but it was hopeless," a man in submerged Kurashiki City said, according to the BBC. "We were hoping to find two people but still can't find one." Millions of people were advised to evacuate their homes. Some houses have since collapsed, while roads and bridges have closed. Officials in Kyoto prefecture say they are trying to control flooding at several dams. "The rescue and lifesaving operation is now a race against the clock," Prime Minister Shinzo Abe said. "There are concerns that further damage may occur through, for example, the loosening of the ground in various locations because of the extended period of rain," Abe said. About 54,000 police, firefighters, Self-Defense Forces personnel and Japanese coast guard have been deployed in the rescue effort, Japan's Chief Cabinet Secretary Yoshihide Suga told reporters. The government plans to mobilize pumper trucks to drain the water, but it may take two weeks to fully drain, Kyodo News agency reported. Responding to the tragedy, U.S. Ambassador to Japan Bill Hagerty tweeted, "Deeply saddened to hear of the lives lost due to heavy rains and flooding in Western Japan. Praying for the safe return of those still missing." Many severe warnings have been lifted as the rains ease, aiding rescue efforts. But authorities say it will take time to determine the extent of the region's damage and casualties.